There are some basic things I eat and don’t eat that probably do have a strong influence on my health and the way I feel. The two specific things I mentioned on the air this past show were Dr Ohhira’s probiotics and apple cider vinegar. 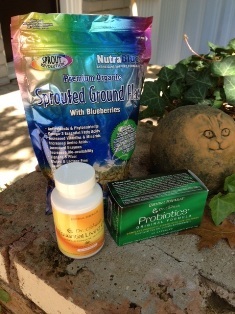 These products are universally healthful for anyone and very simple to use. Take one or two of the probiotic capsules daily and about 1 – 2 ounces of vinegar daily. The vinegar can be taken straight or mixed into water or other drink mixtures. It’s probably a good time to update the rest of my program and health recommendations. Organic gardening is important, but organic living is even more important. Without good health, little else matters. Genetics are important, but environment and nutrition are at least as and much more important for some people. Good health affects weight, skin quality, teeth, hearing, eyesight, reproductive abilities, how many flu and colds you have and enjoyment of life. It also affects your energy, controls your allergy sensitivities and helps prevent the degenerative diseases like diabetes, arthritis, heart disease, Parkinson’s, Alzheimer’s, MS and cancer. Although I keep modifying and improving my program, here’s what I currently do every day – or as often as possible. Redmond Clay, quality natural diatomaceous earth or fine- textured zeolite - 1-2 teaspoons. 2 rounded tablespoons of a quality flaxseed product. 2-3 tablespoons organic apple cider vinegar. 1-2 tablespoons of a quality fish oil. Dr Ohhira’s Essential Living Oils Capsules are my preference. Enough juice and water to make about 8-10 oz. I use pomegranate, cranberry or tart cherry. I often just use Crazy Water. Stir well. With the drink, I take vitamins A, C, D, calcium/magnesium, CoQ10 and later a sublingual B12. In addition to the drink, I eat as much organic fruit and vegetables as possible and grass-finished meats. Avoid white rice and white breads. I have almost completely stopped eating breads and most other grains. The book I recommend on this subject is Wheat Belly by William Davis M.D. I also drink as much filtered water as possible and Crazy Water. I don’t use any salt, at least at home, except Redmond sea salt, but use it generously. I eat fermented food as often as possible and intend to increase that part of my diet. A great book on this subject is The Art of Fermentation by Sandor Zatz. Giving blood every 8 weeks is part of my program. It forces your body to build new blood and helps many people. How much vinegar do you drink in the morning? I drink about 2 tablespoons of vinegar per day. Do you use ginger or cinnamon? I put Cinnamon in my oatmeal when I’m not eating eggs, and I chew pieces of fresh ginger during the day when I remember.